* Support: You can be glass, acrylic, porcelain or china. It should be clean and degreased with a cloth moistened with alcohol. * The traditional stained glass lead is recommended because it can be applied directly knob like a pencil, and the outline is clean and precise. All you have to do, is a slight pressure on the back of the container. 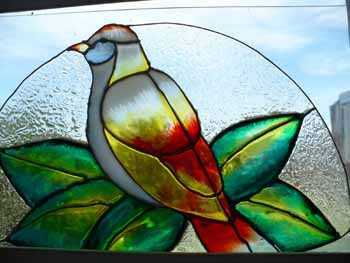 * The stained glass painting has two forms: in knob-billed or bottle. Preferably uses the first option because it can be applied directly from the container. You must not shake the handle before using the paint because it can form bubbles and is not recommended. To use the second option will have to use a brush for application. * Tracing Paper: This tool will serve to sketch the design you choose, the drawing will be only linear. * Tape: serves to hold the tracing paper to the chosen support either glass, acrylic, porcelain, etc..
We know the elements that we will use for our imitation stained glass, now move on to the development. Suitable work is completely flat on a table, a slight mistake can cause the paint to slide somewhere you do not want. On tracing paper held the line drawing of the subject you choose. Once completed, we will sketch above, support tape holding it; delineate above support stained with lead following the lines of the drawing before boceteado, like all around the bracket, let dry for 24 hours. Estimated elapsed proceed to apply the paint stained glass. After the craft left to dry for 7 hours to complete elements to adhere to the substrate.